Japanese anemone are perennial flowering plants indigenous to Japan that are recognizable for their showy, rose-like flowers that appear one per stem. Japanese anemones grow to approximately 24 to 36 inches tall and are hardy in USDA Zones 4 to 8. 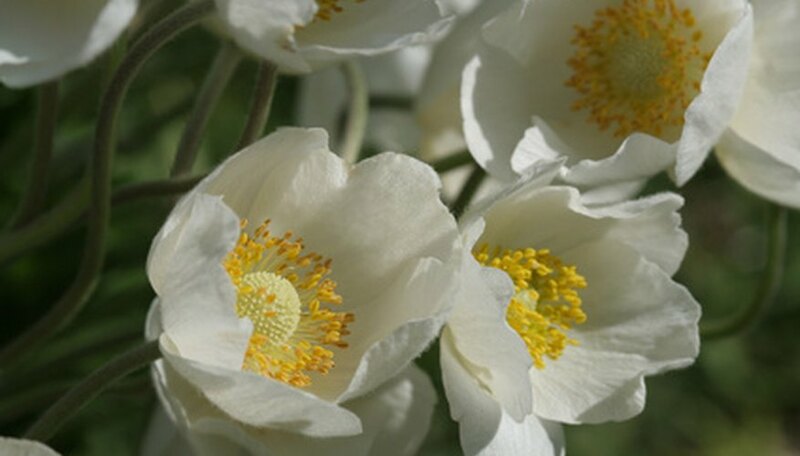 Growing Japanese anemone by seed can reward you with plenty of these charming summer-blooming flowers for your garden. Scoop seed-raising potting soil into 3- or 4-inch plastic pots until they are well filled. Pack down the soil until you are certain it's been well compacted. Pour water into the plastic pots, and allow the soil to soak it up until it is visibly well saturated. Plant two to three Japanese anemone seeds per pot using a pair of tweezers or forceps. Push the seeds into the soil using tweezers. Sprinkle 1/16 of an inch of soil over each of the Japanese anemone seeds. Place the plastic pots inside plastic bags. If you don't have plastic bags, stretch out a layer of clear plastic wrap over each pot and secure the plastic wrap with a rubber band. Transfer the plastic pots to a location in your home that will remain around 60 to 65 degrees Fahrenheit. Keep the soil moist by misting with water. Leave the pots in this location for two weeks. Move the plastic pots to where the temperature will remain between 35 and 40 degrees Fahrenheit. After six weeks, place a layer of newspaper over each of the pots (to exclude light) and return them to the 60 to 65 degrees Fahrenheit location. The Japanese anemone seeds will begin to sprout in about one to three months. Remove the plastic bags or layer of plastic wrap once the seedlings emerge. Transplant the seedlings once they have grown to 3 to 4 inches tall. Pour potting mix into 6-inch plastic pots until each is full to within about a 1/2 inch from the top. Pour water into the pots until the mix is moist. Scoop out a hole in the center of each pot using a trowel. The hole should be about the same size as a 3- or 4-inch pot. Remove a Japanese anemone seedling from its growing container. Set the container horizontally and use the trowel to tap downwards along the rim to slide the container off the root system. Set the Japanese anemone seedling into its new growing container. Scoop in the soil around the Japanese anemone seedling and water thoroughly. Place the pots containing the Japanese anemone seedlings in a location outside where they will receive some protection from wind and sun while they acclimate themselves to exterior temperatures. According to Gerald Klingaman of the University of Arkansas, Japanese anemones grow best where they receive plenty of morning sun and afternoon shade.